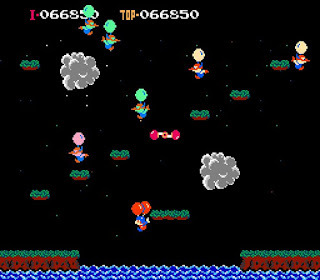 Balloon Fight is Nintendo's version of Joust. The game had the same premise: fly up, hit enemies from above, and try not to let them return the favor. Instead of riding an ostrich around, however, your character and your enemies were dudes with a couple balloons strapped to their backs, and taking a hit popped a balloon. Watching both of them get popped would lead to a fall into the drink where a giant fish was waiting to make a meal out of you. Actually, flying too close to the water would do the same thing if he jumped out at you. Or she. I don't think the monster had a gender. This was one of those games where you almost had to have a certain code of honor while playing. Remember those? "Don't throw me!" "Don't shoot unless the other person has a weapon!" "Only hit the computer drivers!" Yeah, those. In Balloon Fight, you can pop the other person's balloons if you're playing multiplayer, and if you want a sure-fire way to lose a friendship quickly then by all means. (Though, in bonus stages, it's fair game and won't cost a life.) It really was one of those games where you had to agree about hitting each other or not hitting each other before you started...or else you probably will hit each other. With the NES controller. Being swung by the cord. Seriously, it gets mean. When you're flying solo and don't feel like being competitive, there's a mode that involves flying as far as you can while dodging electricity. To this day it's still one of the easiest ways for me to lose track of time, and few single player high score/endurance modes in a game make me as happy and as frustrated as the one in Balloon Fight. These days, Balloon Fight is available on the Wii for 500 Wii Points. If I look around I might still be able to find my e-Reader cards for it, and really I should take a weekend out to re-review the game. It's one of those games I wish had a cheap WiiWare port just for online leaderboards. Also, I leave you with this question: Balloon Fight or Joust?